Happy Monday, everyone! 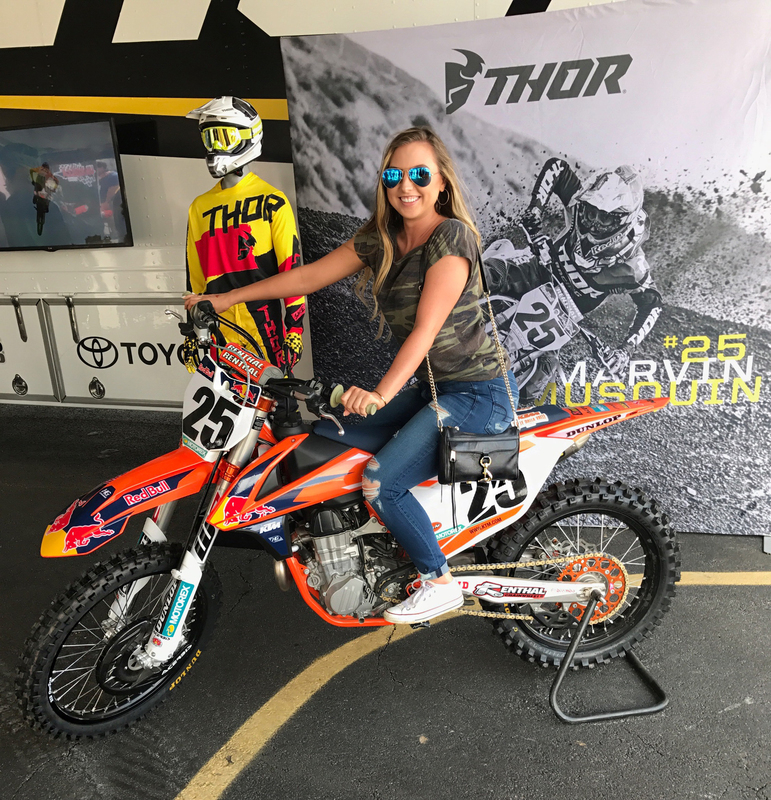 I am back to talk about my wonderful weekend at Supercross! 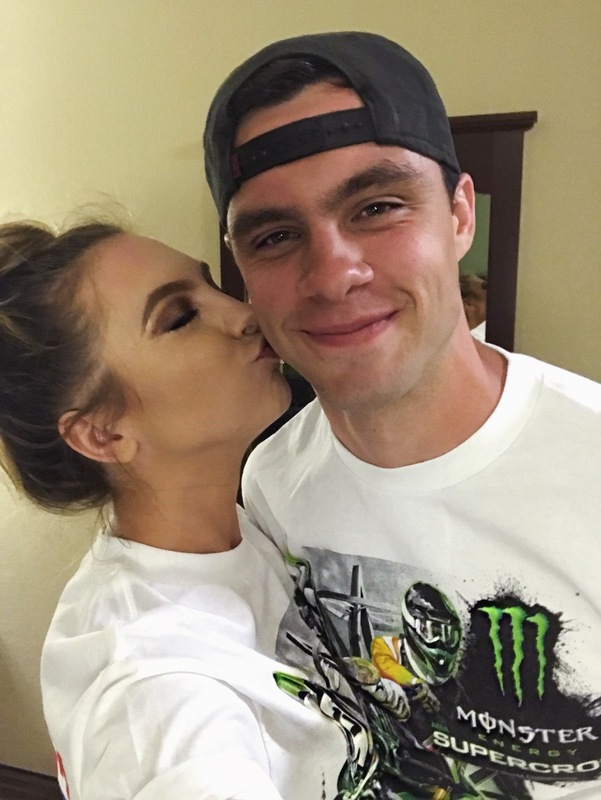 I began watching Supercross when I started dating my boyfriend Cody and immediately got hooked. Thankfully, he is very patient with explaining it all to me and I have looked forward to watching the races with him every Saturday night since January. With his birthday in March, I wanted to get him something a bit more memorable than clothing or cologne. I wanted to give him an experience. 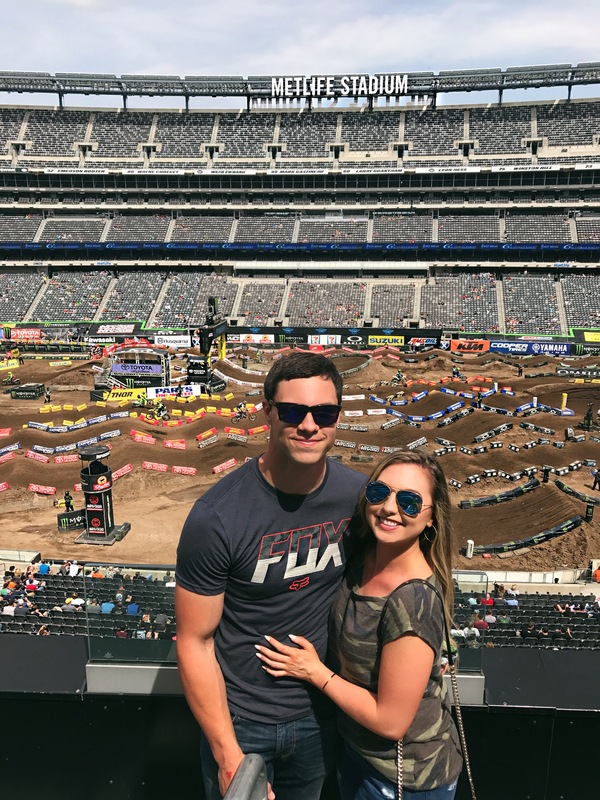 When I saw how into Supercross he was and how he had only been once, I thought tickets to Supercross at Metlife Stadium were the perfect gift. When I initially bought them, I could barely hold in my excitement until his birthday on March 7th. I’m very glad when he opened the tickets, he was as excited as I hoped he was. We began planning out the weekend and making travel arrangements. We decided it would be best to rent a car since we did not want to put the miles on either of our vehicles and knew the traffic in New Jersey would not be pleasant. The drive down took roughly four hours, as expected, and we didn’t hit traffic until we were within about 5-10 miles of our hotel. Even then, it wasn’t a total standstill and was manageable. However, Cody may disagree as it was not easy changing lanes with the GPS taking us in a million directions. We booked a room at Extended Stay which was a fairly nice hotel that had a kitchen in the room. It was cheap, it was close to the stadium… easy enough! We knew we wouldn’t be spending much time in the room throughout the weekend so we were not picky. Ultimately, it was a good place to stay and we would probably book with them again if we return. On the way down, I saw a sign for a Chick-Fil-A, aka my favorite restaurant of all time. 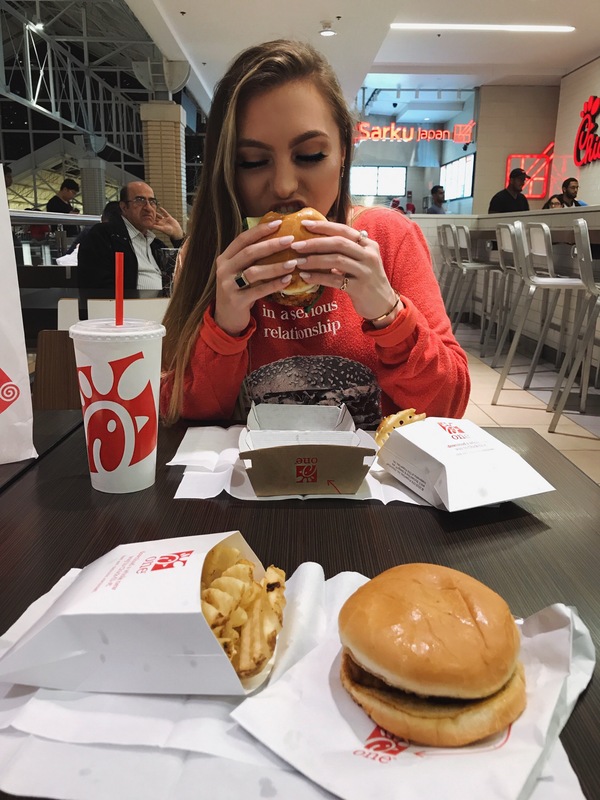 I found out Cody was a Chick-Fil-A virgin so we had to go. Getting there from the hotel was not an easy task. It was located in a mall that was nearly impossible to get to with traffic and road work everywhere. Definitely made some slightly dangerous maneuvers to change lanes but we made it safe and sound! And it was worth the traffic for sure. Super attractive shot, I know. Thanks, Cody. We hit some traffic coming back around 10pm, (where are you people going at 10pm?!) and got back and passed out before our big day ahead. Saturday morning, I woke up bright and early. I got out of bed to turn my phone alarm off across the room and looked back to find Cody had stolen my pillow and all the blankets. I took that as a sign to start getting moving for the day. Later, Cody walked across the street to get us Dunkin for breakfast. After going back and forth for a while, we ultimately decided to take a cab to the stadium instead of dealing with traffic and paying for parking. The ride down was quick and easy and we barely hit any traffic at all. I purchased Pit Passes as well so we then went down to check out the Pit Party. There, we took lots of photos with bikes and got to see some riders. We also stuck around for the exhibition show with motorcycle stunts and a trophy truck doing serious donuts in the parking lot. 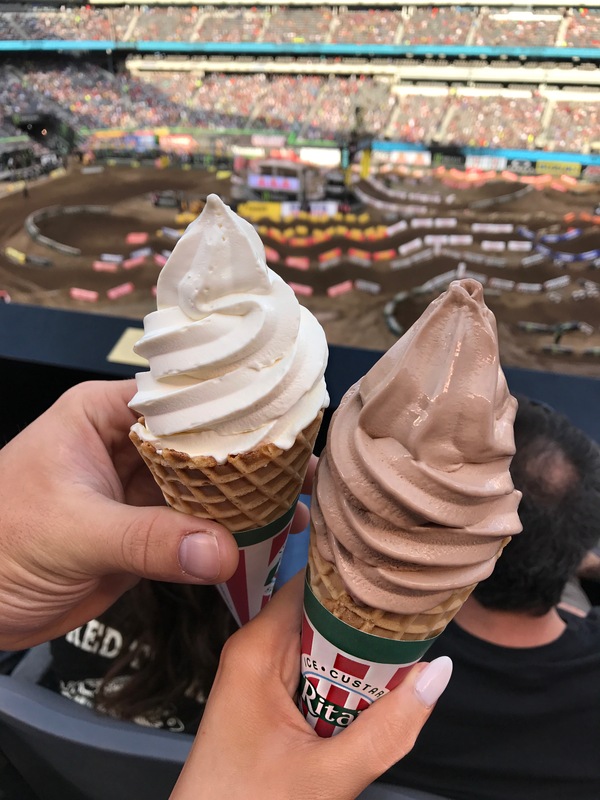 After that, we grabbed a quick bite and got into our seats before the races started! Now, this specific race was a bit dramatic. One rider, Eli Tomac, caught up to a 30 point lead by the two-time defending champ, Ryan Dungey, so the championship title pretty much came down to this second-to-last race before the final showdown in Las Vegas. 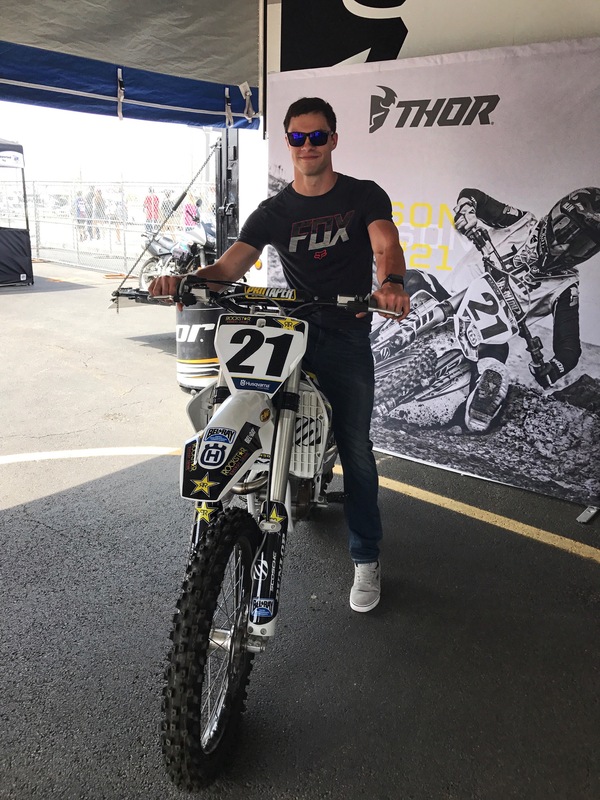 We were rooting for Tomac since Cody’s favorite rider Roczen got hurt early in the season. However, I also like Marvin Musquin because his podium interviews are my favorite. The Heat Races started off pretty well and we had high hopes going into the Main Events. Unfortunately, the results of the race were not what we wanted. 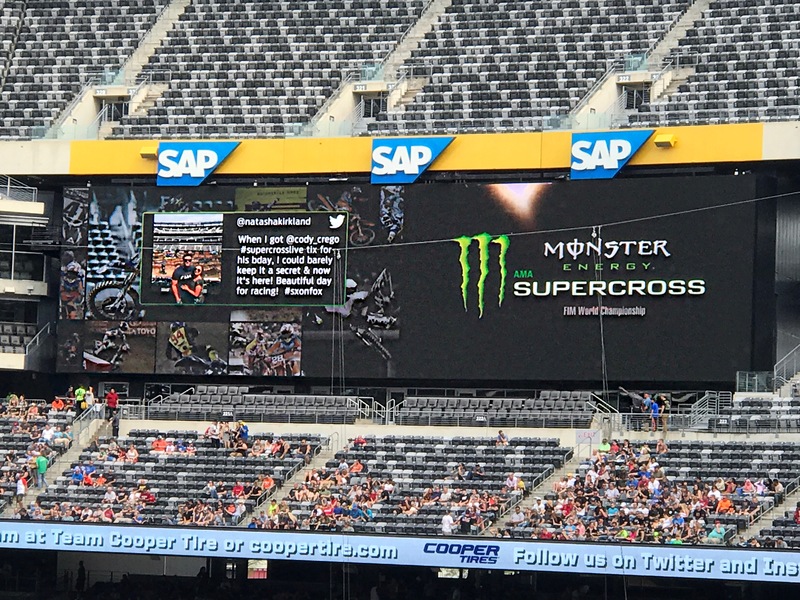 Though it was pretty disappointing, we didn’t let that get us down during our perfect weekend; especially when it included the best custard from Rita’s and our photo being featured on the big screen at Metlife Stadium! The races were still very exciting with lots of crashes and quick passes and it was awesome to see it in person for the first time. 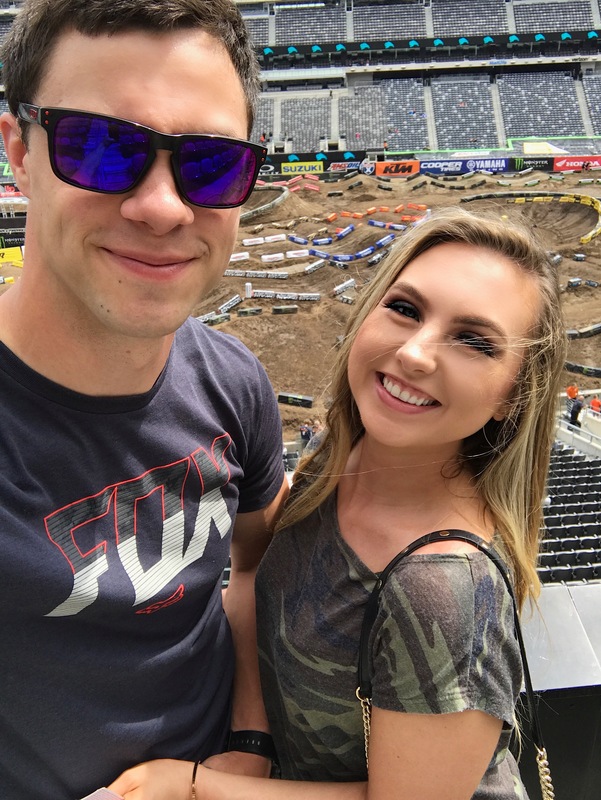 Overall, my first Supercross experience was definitely a great one that I will always remember. I have a serious case of the Monday’s today because I didn’t want the weekend to end. But at least Cody and I can reminisce with our matching t-shirts.